Don’t let these red flags scare them away. When you decide to put your house on the market, you start looking at your surroundings through a new lens: What would a potential buyer think of this space? Likely there are rooms and specific items you know absolutely need some attention or complete replacement before anyone tours your home, but it’s not always easy to see what’s become normal to you as concerning to a potential buyer. The room this is most likely to happen in, and most likely to influence buyers no matter what the rest of your house looks like? The kitchen. 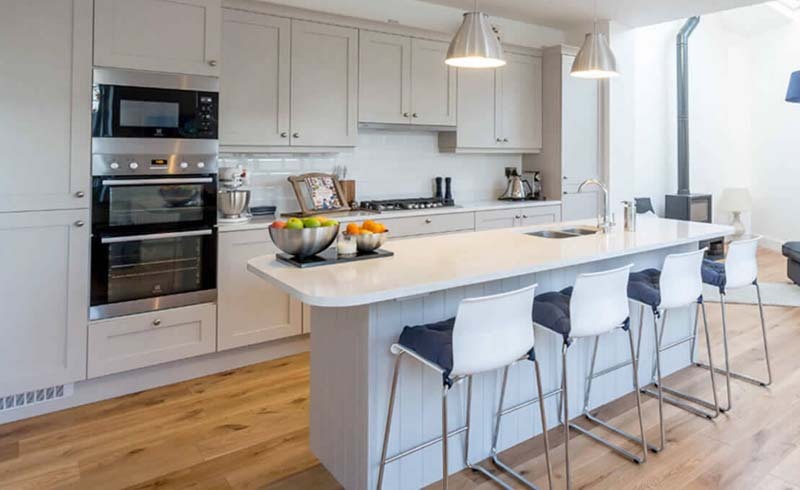 The kitchen is the heart of the home, and as much as we love to look at beautiful photos of newly renovated kitchens, the reality is your kitchen is not going to stay as pristine as your formal dining or living room. It’s a work space, a gathering spot, a cleaning area, and an eating space. Even so, buyers have high expectations (and little wiggle room) when it comes to kitchens, from starter homes to multi-million dollar mansions. Aside from outdated appliances and design features, there are several things in your kitchen that you may not even think about that will concern potential buyers. Here are 5 you should address before your first open house, no matter what. A few crumbs on the counter are one thing, but spills on the stove that have been there for weeks are another—and buyers can tell the difference. It can admittedly be easy to get used to some of the mess that comes with normal cooking habits. If you think your kitchen might be a little on the well-worn side, go ahead and hire professional cleaners before listing your house—and don’t forget the insides of your appliances and cabinets. Buyers might take a peek to see how well the home is maintained and you don’t want that to scare them off. Bug and pest infestations can come at any time of year, and quite frustratingly, to homes at every level of cleanliness. And more times than not, they’ll end up in your kitchen. However, any sign of bugs will turn off a potential buyer because there’s an instant concern that the problem is bigger than it looks. If something is an issue before you list your house, go ahead and try to resolve the infestation before you list. But if you get a sudden outbreak while you’re already on the market, make sure to hide any treatment products or traps before showings so as to not alarm buyers. 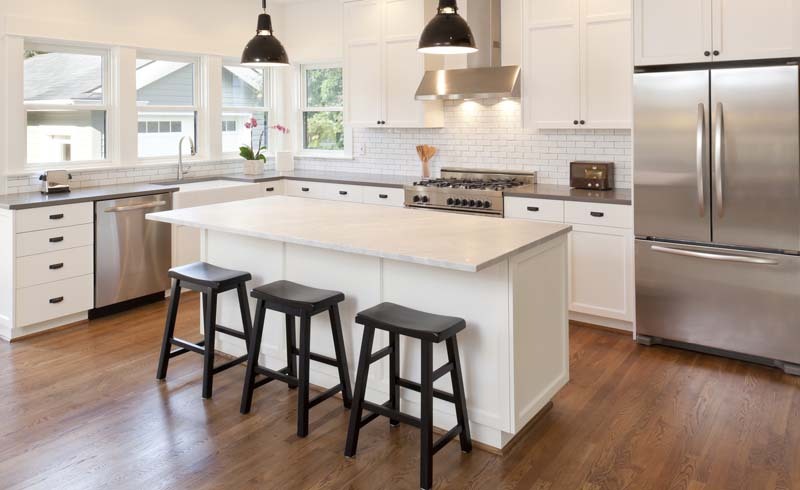 If you’ve been making do with a dated kitchen and don’t have the budget for a remodel before selling, it can be tough to see how much a fully updated kitchen would raise your listing price. Don’t let that tempt you to do a cheap, quick fix on your kitchen, though. It’ll only take one or two noticeably amateur projects to completely turn off a buyer for fear that you’ve addressed other issues in the house the same way. If your kitchen is functional, just outdated, do some low-lift replacements like switching out cabinet hardware and your faucet, or even paint your kitchen cabinets if you know the wood is an unpopular shade. But don’t waste your money on poorly executed “improvements” that only look nice from far away. Buyers will see the lack of quality in an instant and walk away. Everyone you know may love your cat, but a lot of potential buyers will not love knowing the house has had a cat living in it—or dog for that matter. We know it’s a bit of an irrational concern for buyers since the pet obviously won’t stay with the house, but it’s one that carries a lot of weight so it’s worth addressing. If it’s possible for your pets to stay at a family member or friend’s house while your home is on the market, that’s probably for the best. Seeing your actual pet, their litter boxes and food bowls, or smelling anything animal-related could turn off any number of buyers. If your home is anything like ours, the kitchen is where schedules are kept, notes are left, medicine and vitamins are left out as reminders, and appliances that get used regularly don’t get put away. You may have a solid organization system for anything on your counters or on the walls in your kitchen, but anything that is visible to someone walking through your home will come across as clutter. Try to eliminate as much as you can from your countertops, completely clear off anything on your refrigerator doors, and take down any calendars or bulletin boards that you wouldn’t post a picture of on Facebook. Don’t stash all these extra items in your pantry or cabinets, though. Buyers are likely to look inside storage areas, and you don’t want it to look like you’re bursting at the seams. That’ll give buyers the impression that they too would quickly max out the available storage space and see your house as too small.